Mimi Holtz, author of Mimi Avocado, has been married to her California avocado farmer husband for over 30 years, raising their four children, and teaching music. Originally from Vermont, she writes about life on an avocado ranch, sharing stories, healthy recipes, and her favorite new discoveries. 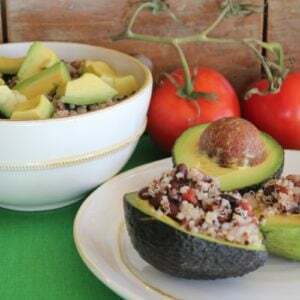 This Black Bean Quinoa Avocado Salad is one of my favorites, and it’s easy to do with just a few ingredients.